UMT faculty members and students attended the first Pak-German Workshop on Field Robotics held at the LUMS School of Science & Engineering (SSE). 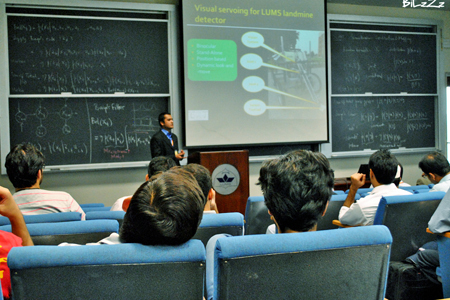 The event was organized by LUMS SSE in collaboration with University of Kaiserslautern, Germany. Jawwad ullah and Aqeel Arshad, faculty members from the Department of Electrical Engineering, represented UMT during the workshop. Bilal Sheikh and Aqeel Tariq, students from Department of Electrical Engineering, attended the workshop as well. The workshop aimed to introduce new and exciting areas of research in field and off-roadrobotics. Faculty members and students from different universities such as NUST and NED Karachi attended the workshop. At the closing ceremony, Dr Shahid Masud, Associate Professor, Department Chair Electrical Engineering, LUMS, distributed certificates among the attendees.